Successfully Added Wireless Fish Finder - Sonar Technology, 36m Depth, Adjustable Sensitivity, Fish Size, Water Temperature, Fish Alarm to your Shopping Cart. This wireless fish finder will inform you whenever fish is near. With this piece of fishing equipment, you’ll never again return home empty handed. Its sensor has a 90-degree angle beam. Thanks to this, not a single fish in your area will stay unnoticed. The fish finder furthermore uses sonar technology. Though this, it provides you with highly accurate information about the fish in the area. On its large LCD display, this fish finder provides you with an abundance of information. You will accurately see whether there is fish in the area. Furthermore, the fish finder will tell you about the size and depth of the fishes. It allows you to adjust the sensor’s sensitivity and to focus on a certain depth. This makes it easier to find a specific type of fish. Whenever fish has been spotted in the area, the tracker will inform you through an audio alarm. With a 100m wireless range, you’ll be able to use this gadget for all sorts of fishing. It is capable of spotting fish up to a depth of 36m. Additionally, it tells you the water temperature and bottom contour. The fish finder is powered by 4 AAA batteries (not included). With this, it provides you up to 500 hours of continuous usage time. 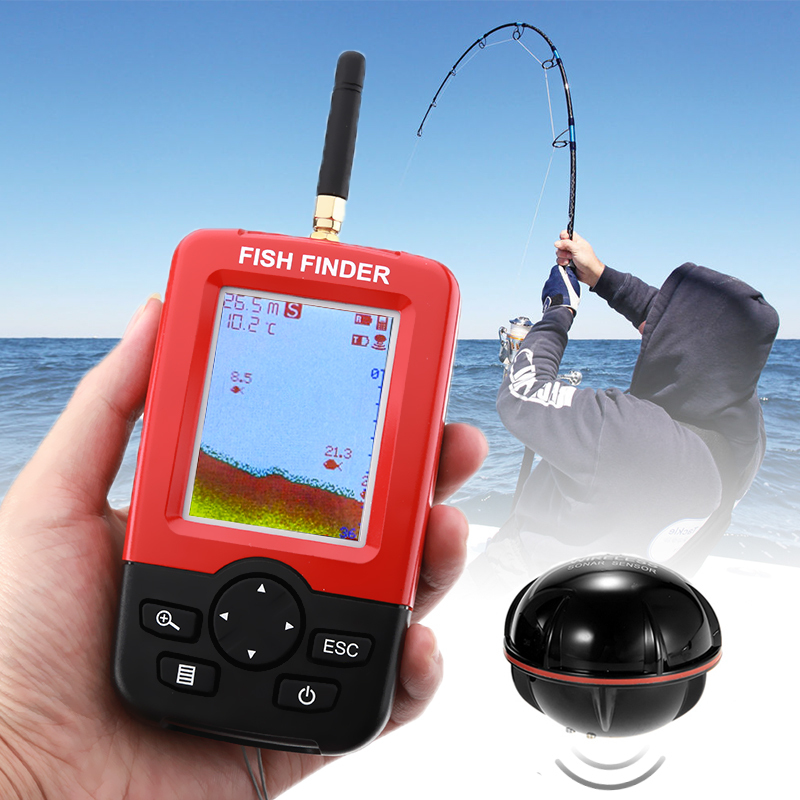 This fish finder is a great piece of fishing equipment for professional and hobby fishes. Arabic: - الباحث عن الأسماك - Chinese Simplified: - 鱼探仪 - Czech: - Vyhledávač ryb - Danish: - Fishfinder - Dutch: - Vis Finder - French: - Trouveur de poissons - German: - Fishfinder - Hebrew: - מוצא הדגים - Hindi: - मछली खोजक - Italian: - Cercatore dei pesci - Japanese: - 魚群探知機 - Korean: - 물고기 측정기 - Malay: - Pencari ikan - Norwegian Bokmål: - Ekkolodd - Romanian: - Fish Finder - Russian: - Искатель рыб - Spanish: - Buscador de los pescados - Thai: - อุปกรณ์ตกปลา - Turkish: - Balık Bulucu - Vietnamese: - Cá Finder.